Social enterprise Happy to Be, founded by a Middlesex alumna, has won the first ever Entrepreneurial Barnet competition. The competition, organised by Middlesex University, Barnet Council and Barnet and Southgate College, offered students, alumni and local entrepreneurs the chance to win £1000 of prize money and business mentoring from industry experts. 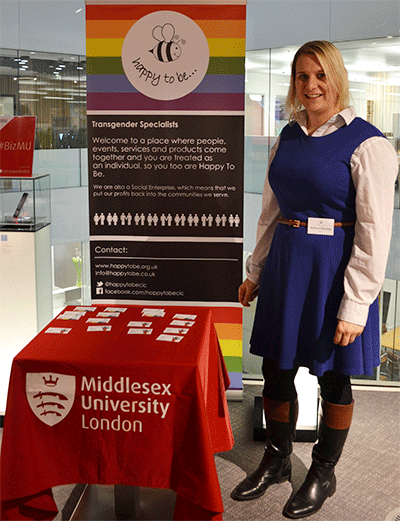 Rebecca Manning, who graduated from Middlesex in 2014 with a BSc Nursing (Mental Health) was selected as winner from a group of four finalists. Her company, Happy to Be, was launched in 2015 with the aim of improving mental health for people questioning their gender identity. The organisation provides professional peer support, networking and training for the LGBT community, as well as consultancy services for organisations to raise awareness and promote diversity. “Not only does the prize money mean so much, but the awareness and exposure created from the competition across businesses and the council has been brilliant,” Rebecca said of her win. “Even just the validation that Happy to Be is a good idea is wonderful.